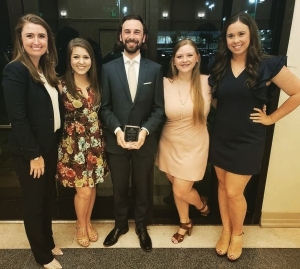 Joshua Newville (LSU Law ’12) was named the recipient of the 2019 Kalinka Award for Coach of the Year at the Law Center’s annual Advocacy Programs Banquet on April 9. Newville is one of the coaches of the Law Center’s Costello Criminal Trial Team, which this year took home the national championship title. He was nominated separately by each of the members of the Costello team. “He [is] tough but fair. His knowledge of the rules of evidence and this competition specifically exceeded my expectations and I can only hope to be a talented as he is one day. He worked diligently in preparing us for the competition and supported us the whole way through. I was truly blessed to be a part of such a valuable experience and team with invaluable coaches,” read one student’s nomination letter. Newville, Section Chief at the East Baton Rouge Office of the Public Defender, and Lindsay Blouin (’12), Deputy Chief Defender at the East Baton Rouge Office of the Public Defender, coached students Elise Benezech, Brooke Delaune, and Allena McCain to a national championship at the John L. Costello National Criminal Trial Competition in Fairfax, Va., in February. The Coach of the Year Award is named in honor of the late LSU Law Professor Susan C. Kalinka. She coached the Law Center’s National Taxation Moot Court Team (now, courtesy of a generous endowment, the Kalinka-Stutes Tax Team) for more than a decade and prepared students to participate in the ABA National Student Tax Challenge. Kalinka was an exceptional teacher and scholar, and the teams she trained have set the high standard of excellence for the Law Center’s Advocacy Programs. The Kalinka Award recognizes a coach of one of the LSU Law Center’s external competition teams who embodies the inspiration and dedication of Professor Kalinka.